Grease burns usually occur on the skin while cooking meats that have a high fat content. When the meat is cooked at too high of a temperature, the fat melts quickly, and splatters out of the pan and onto the skin. This fat is extremely hot and will cause a mild burn on the skin. Once the burns heal, marks will be left behind that can cause the skin to look speckled. The marks can be difficult to remove and may last for months. Luckily, certain substances can be used on the skin to remove marks from a grease burn. Loosen dead skin and purge impurities by applying Castor oil. Castor oil is a powerful purgative, as well as a highly emollient oil. Applying it to a grease burn mark will soften and lift the skin from healthy, smooth skin, and will allow it to be scrubbed off easier. Smooth 1 tsp. of Castor oil over the burn marks, and rub it in deeply for around 3 minutes. Let the oil remain on the skin for 5 more minutes. Place a hot, wet cloth over the skin until it cools down, then wipe off the oil with the cloth. Use Castor oil as a purgative and skin softener once per day. Scrub off the dead skin with baking soda. Baking soda is abrasive enough to scrub off loosened skin cells, but gentle enough not to damage the skin's surface. Combine 2 tsp. of baking soda with a drizzle of water, making a soft paste that is the consistency of toothpaste. Rub the paste onto the skin for 2 minutes, then rinse the skin off with water. This will remove the loosened grease burn marks. Use a baking soda scrub once per week. Soak the skin in lemon juice to rejuvenate the skin and help promote new skin cell growth. Lemon juice contains high levels of vitamin C, which fights off free radicals and helps the encourage new cell growth. 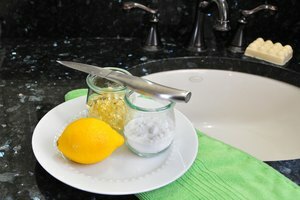 Soak a cloth in lemon juice until it is completely wet. Drape the cloth over the area with the grease burn marks for 5 minutes. This will help the lemon juice soak into the skin and help stimulate cell growth. Remove the cloth, and let the area air dry. Use lemon juice on the skin once per day.